Iran has been formally PUT ON NOTICE for firing a ballistic missile. Should have been thankful for the terrible deal the U.S. made with them!” – @RealDonaldTrump tweet, 2 Feb. 2017. 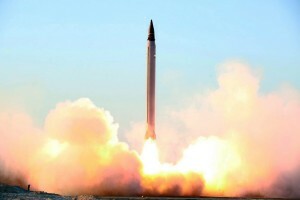 On 21 January Iran test-fired a ballistic missile for, in their words, “legitimate defensive purposes”. From Iran’s perspective, this was a reasonable claim. There is no international treaty banning the tests and the only relevant UN Security Council resolution calls on Iran to avoid missile tests “designed” to carry nuclear weapons. Under the historic nuclear agreement reached in July 2015 Iran gave up its ability to develop nuclear weapons and submitted to extremely intrusive on site monitoring and other advanced verification measures, designed to ensure it honoured this deal. In return Iran got crippling international sanctions lifted so its economy could get moving again. In response to the first Iranian ballistic missile test since he took office, President Trump bellowed and tweeted out a series of threats, alleging Iran was “playing with fire”, and putting them “formally on notice” for [allegedly] breaching UN resolutions. The UN Security Council on 3 February, while concerned, found insufficient evidence of Iranian non-compliance and commissioned a report before deciding on any further action. On Friday, 4 February, before any UN report could be produced, the Trump administration levied unilateral American sanctions against Iran. The Iranian government immediately responded with a verbal tirade of its own, and another missile test. Despite all the earlier bombast, there was no further response from President Trump, who was by then immersed in a new battle with the American judiciary over the constitutionality of his vile Muslim travel ban. So how tough are these sanctions? This is not to downplay the negative impact of Trump’s rhetoric. Even empty words play right into the hands of the hardliners in Tehran who oppose the historic nuclear agreement as vehemently as the hardliners in America. But it is too bad the media missed a key aspect of this saga — that Donald Trump, for all his bully boy bluster, pulled his punches when it came to Iran, for fear that hurting American jobs would hurt him too.